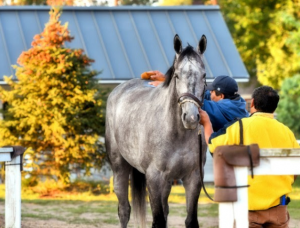 The National Museum of Racing and Hall of Fame in Saratoga has launched Foal Patrol, a fan-based interactive web program that tracks the lives and daily routines of several in-foal mares during their pregnancy through the birthing process. 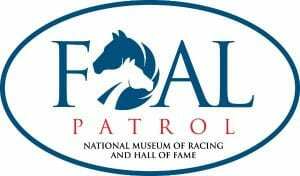 On Sunday, November 5th, at noon, the National Museum of Racing and Hall of Fame in Saratoga Springs will hold a Man o’ War Spotlight Tour. 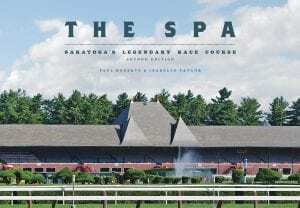 The Saratoga Springs Preservation Foundation will host an event honoring the history and future of the Saratoga Race Course on Tuesday, August 15, 2017 at 5:30 pm at the National Museum of Racing and Hall of Fame, 191 Union Avenue. The National Museum of Racing and Hall of Fame has announced a series of Triple Crown events for the 2017 season. The National Museum of Racing will induct its 2012 Hall of Fame class Friday at 10:30 a.m. at the Fasig-Tipton sales pavilion. Jockeys John Velazquez and Anthony Hamilton, trainers Roger Attfield and Robert Wheeler, and racehorses Ghostzapper and Planet will be enshrined. Tom Durkin, the track announcer for the New York Racing Association, will serve as the event’s master of ceremonies. The ceremony is free and open to the public. The inductions are also available through a live stream on the Museum’s website. Radio coverage will be provided by Horse Racing Radio Network. Through Monday, Velazquez has won 4,841 races and has earned more than $268 million. He won the Eclipse Award for Outstanding Jockey in 2004 and 2005 and led all North American riders in earnings during those years. He led all New York jockeys in wins from 2001 through 2004 and set a record with 65 wins at Saratoga in 2004. Velazquez has won 22 riding titles at New York Racing Association tracks and has nine Breeders’ Cup wins. He posted 50 Grade 1 wins from 2006 through 2011. Velazquez won the Kentucky Derby in 2011 with Animal Kingdom and the Belmont Stakes in 2007 with Rags to Riches and 2012 with Union Rags. His other major victories include the Travers, Alabama, Champagne, Sanford, Personal Ensign, Whitney, King’s Bishop, Hollywood Derby, and Kentucky Oaks. Hamilton was born in Charleston, S.C., in 1866 and won many of the most prestigious races of the 19th century. In 1890, Hamilton rode Potomac to victory in the third edition of the Futurity, which at the time was the richest race in American history with a purse of $67,675. That year, Hamilton led the nation in winning percentage (31.2). In 1891, he boosted his national-best win percentage to 33.8 and won 154 races to place second in the national standings. In 1895, Hamilton won two of the most prominent races in the country by taking the Brooklyn Handicap on Hornpipe and the Suburban Handicap aboard Lazzarone. The next year, Hamilton added the third major New York handicap event, the Metropolitan Handicap, with Counter Tenor. 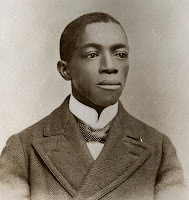 Hamilton is the only African-American jockey to win all three of New York’s major handicap races. 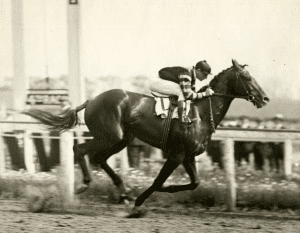 During this era, these races were generally considered to be more important than the likes of the Kentucky Derby, Preakness Stakes, and Belmont Stakes. Hamilton’s other major victories included the American Derby (1887), Lawrence Realization Stakes (1891), Monmouth Oaks (1889, 1890), Monmouth Invitational Handicap (1889, 1892), Juvenile Stakes (1890), Gazelle Handicap (1887, 1890), Nursery Stakes (1886), Flatbush Stakes (1889, 1890), Sapling Stakes (1891), Swift Stakes (1892), Toboggan Handicap (1890), Twin City Handicap (1886, 1888, 1889, 1892, 1894), Great Trial Stakes (1892), Tidal Stakes (1891), Hudson Stakes (1889), and St. Louis Derby (1888), among others. Through Monday, Attfield has saddled the winner of 1,745 races and has purse earnings of more than $90 million. He has won the Sovereign Award for Outstanding Canadian Trainer a record eight times and trained three Canadian Triple Crown winners (Izvestia, With Approval, and Peteski). Attfield has won a record-tying eight runnings of the Queen’s Plate and seven editions of the Canadian Breeders’ Stakes. He won his first Breeders’ Cup race in 2011 when Perfect Shirl took the Filly and Mare Turf. Attfield is a member of the Canadian Racing Hall of Fame. The many other stakes races he has won in the United States include the Wood Memorial, Flower Bowl, Shadwell Turf Mile, Maker’s Mark Mile, Elkhorn, Yellow Ribbon, Orchid, and Carter Handicap. Wheeler, whose career spanned from 1938 through 1992, won 1,336 races and trained for prominent owners such as C.V. Whitney, J. Rukin Jelks, Greentree Stable, and Nelson Bunker Hunt. He conditioned 56 stakes-winning horses, including 1982 Champion Older Female Track Robbery. The majority of his career predates the grading of races, but from 1976 on he won 18 of the 69 (26 percent) graded stakes his horses ran in and 44 of his 175 (25 percent) overall stakes attempts. In 1959 and 1960, Wheeler’s West Coast-based division included Tompion, winner of the Santa Anita Derby, Blue Grass Stakes, and Malibu, and the distaff pair of Bug Brush and Silver Spoon. Bug Brush won six stakes at 4 and set a world record the day she beat males Hillsdale and Terrang in the San Antonio Stakes. Silver Spoon, a member of the Hall of Fame, won 10 stakes in two years, including the trainer’s first of back-to-back wins in the Santa Anita Derby, in which she defeated Preakness winner Royal Orbit. He also sent out five winners of the Hollywood Juvenile Championship, which prior to the Breeders’ Cup era was one of the nation’s top races for 2-year-olds. From 1959 through 1969, Wheeler was on the leaders list of the top 30 North American trainers seven times in terms of earnings. His division accounted for more than 60 percent of the earnings of the C.V. Whitney stable when it led all owners in 1960. Ghostzapper (Awesome Again-Baby Zip, by Relaunch) won 9 of 11 career starts and earned $3,446,120. He was named Horse of the Year and Champion Older Male in 2004 when he posted a 4-for-4 record. Trained by Hall of Fame member Bobby Frankel, Ghostzapper won the 2004 Breeders’ Cup Classic in stakes-record time, covering the 1¼-mile distance in 1:59.02. That year, he also won the Woodward Stakes, Tom Fool Handicap, and Iselin Handicap. At 3, Ghostzapper won the Vosburgh Stakes. He closed out his career with a victory in the Metropolitan Handicap at age 5. Ghostzapper raced for Frank Stronach and is currently a stallion at Stronach’s Adena Springs in Kentucky. Foaled in Virginia at Maj. Thomas W. Doswell’s Bullfield Stable in 1855, Planet was sired by Revenue out of the Boston mare Nina. Planet was a sensation from the start. He made his debut with a victory over four others in mile heats for a purse of $10,750 in Fairfield, Va., on May 4, 1858, and went on to establish a record for career purse earnings that stood for 20 years. Planet displayed his remarkable skill and versatility by compiling a record of 27-4-0 from 31 starts and earning $69,700. Known as “The Great Red Fox,” Planet was regarded by many turf experts to be second only to the mighty Lexington among the greatest American racehorses prior to the Civil War.